Although the measurement of blood pressure has been a medical practice for about 100 years now, used by physicians to make a diagnosis, it is only recent that self-tracking your blood pressure has become a reality. To assist hypertension, a study has proved that keeping a blood pressure monitor at home can be of great help besides the routine checkup at the clinic. The Heart Association of United States of America advises all people to monitor blood pressure at home to assist their doctor in determining if the medications are effective and gives a perfect idea of the condition in the veins. As hypertension has no prior symptoms and you cannot detect the instabilities in the blood pressure in any way, evaluating through blood pressure machine is the sole possibility to get the proofs. There is a wide range of home blood pressure monitors available in the market; however, choosing the accurate and right one for you is very important. Therefore, we bring to you the 3 best automatic cuff blood pressure monitors that are clinically validated, cost-justified and they are capable of giving you the accurate readings, keeping a track of a large number of measurements. These devices will not leave you regretting in the end that is guaranteed. Individually tested for guaranteed accuracy, Vive blood cuff pressure monitor is a portable device, highly suitable for patients with high blood pressure. It allows you to accurately track your systolic and diastolic blood pressure as well as the pulse rate being at home. It is an automatic device and is easy to use for a layman. Its quality is similar to the ones the doctors use. It consists of a radiant blue LCD display that displays all the measurement with time and date giving a clear view. With a total memory of 500 measurements, this device records and stores up to 250 reading per user including the date and time of the measurements. Furthermore, it has a wide range arm cuff to comfortably fit arm measuring 22 to 42 cm. It comes with four AAA batteries that run the device. An illustrated user manual is also included that guides the user how to set up date and time and also demonstrates how to set up multiple users and clear the readings, making it more your convenient and easy to use. 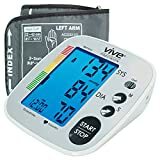 Therefore, the compact, lightweight, easy to use and simple setup Vive cuff blood pressure monitor is a must-have for people like us who are not much aware of the technicalities of medical instruments. 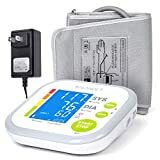 If you are looking for a blood pressure monitor with a reputed brand image and accuracy, Omron 5 series upper blood pressure monitor is exactly what you need. Omron is the no. 1 selling manufacturer of blood pressure monitors for 40 years, highly recommended by doctors and pharmacists. You cannot doubt the accuracy of this technology that ensures consistent and precise readings. It has a dual setting for more than one user, allowing you to monitor and auto save the last 50 readings for an individual along with time and date. Unconventional system of averaging routinely shows the estimate of up to previous three evaluations that were recorded in the past ten minutes. It also alerts you instantly if any irregular pulse rate is detected while you evaluate your blood pressure. It has a wide range cuff that fits an arm with 9 to 17 inches of circumference. Four Duracell AA batteries are included to run the monitor. It also has an instruction manual in English and Spanish for your guidance and better usability of the device. If you will trust your heart to Omron, you will be empowered with accuracy. 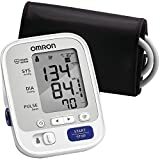 Hence, buying the Omron 5 series upper blood pressure monitor means buying the last blood pressure monitor you will ever need! Balance blood pressure monitor makes taking your measurements quickly and easily. If you spend a lot of time traveling, then this is the product that is made for you, as it is lightweight and comes with a case for convenient storage and mobility. This FDA registered first-rate monitor has been tested for trustworthy results. The large backlit LCD screen with over-sized digits makes the measurements visibly clear and easy to read. It has a one-size-fits-all cuff that fits most the adult users perfectly. Two users can record up to 60 results each and the hypertension indicator bar and irregular heartbeat sensors alert you to any issues. It measures systolic and diastolic blood pressure, as well as pulse, with a single button. It comes with four AAA batteries and device turn off automatically to save the battery from being over-used. A great portion of your greater good’s purchase is given to charity which makes you a part of a great cause. Balance blood pressure monitor comes with a 2 year warranty for any defects or damage. With Balance blood pressure monitor by your side, your measurements are just a single button press away!